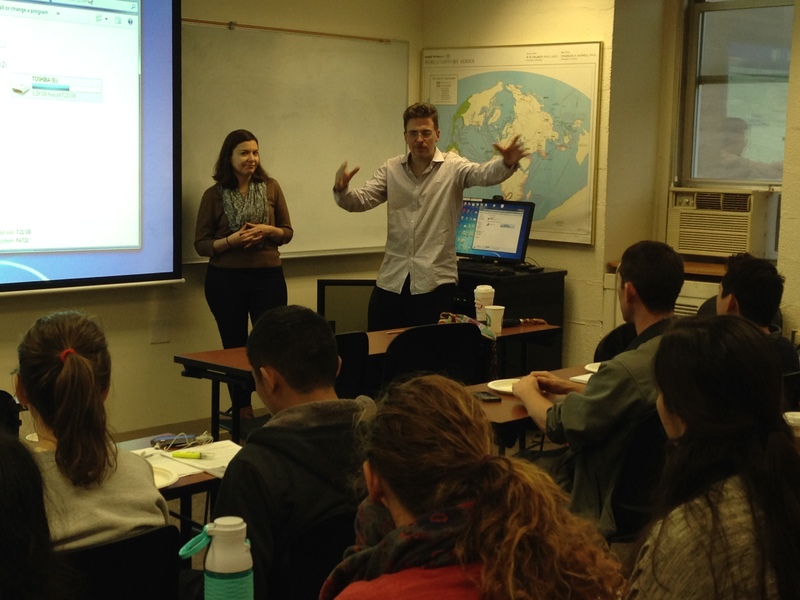 The International Political Economy and Development (IPED) Program at Fordham University hosts a weekly lecture series. 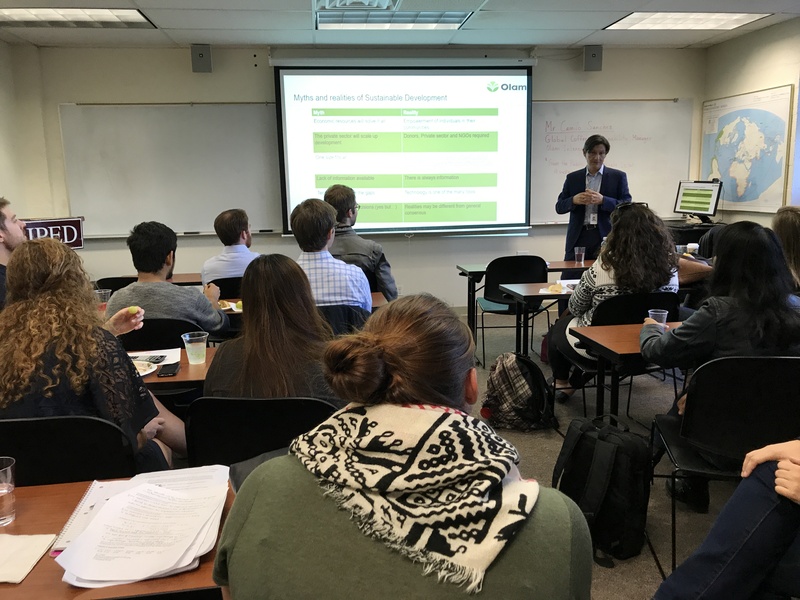 Guests from the non-profit, public, and private sectors present on topics of interest to both graduate students in the IPED Program as well as to students in various departments across the university. Tyler Falish (IPED ’17) is a senior associate at Kroll, a division of Duff & Phelps. Kroll is the leading global provider of risk solutions helping clients make confident risk management decisions. 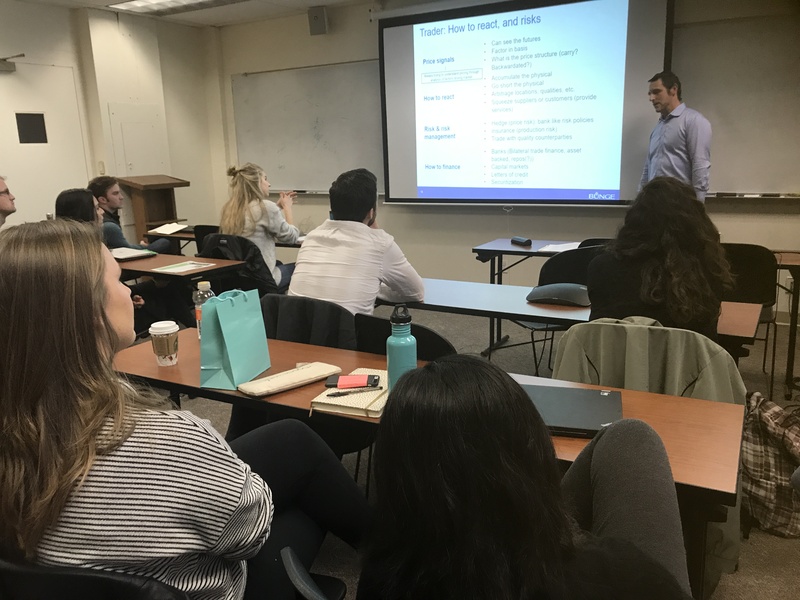 During this lecture, students got a sneak peek into how business intelligence is collected and what corporate espionage entails. 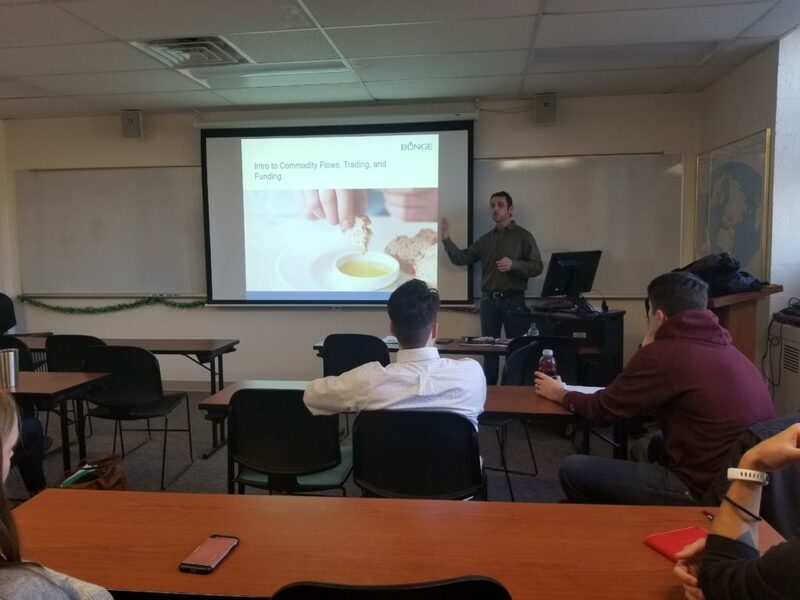 Mr. Falish went through the different types of risks organizations face when making business decisions, types of investigations Kroll does and the tools it uses to gather the information its clients seek. He also told us how his IPED education uniquely prepared him for his career with Kroll and shared internship opportunities with students. 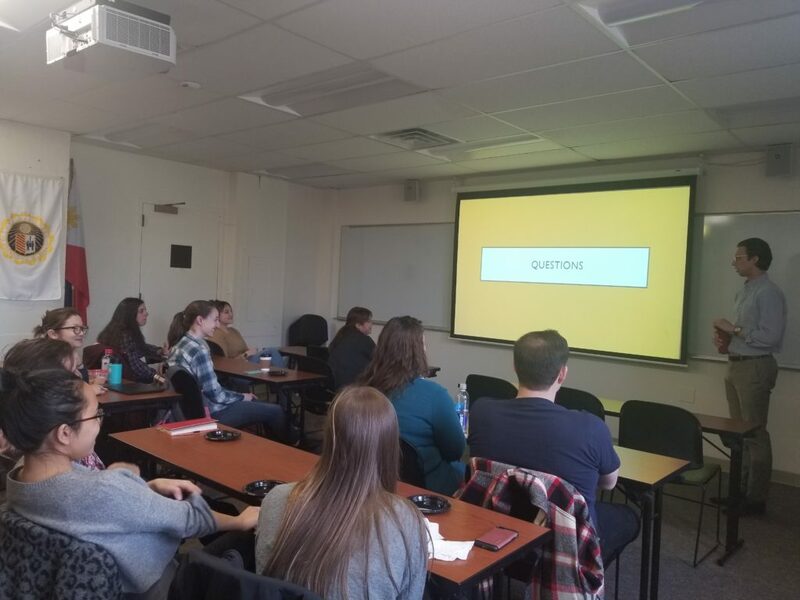 The weekly IPED Lecture Series hosts speakers from the non-profit, public, and private sectors who present on a wide variety of topics that are of interest to graduate students in the IPED Program as well as undergraduates in IPE and other interested students. Federico is Director of Portfolio Management at Global Capital Group, a wealth management firm that provides sophisticated investment solutions to individuals, families and institutions around the globe. Mr. Righini gave us a thorough examination of the eurozone citing evidence for divergence between member nations using a variety of macroeconomic indicators such as GDP PPP per capita, household disposable income, real effect exchange rates and debt to GDP. He also noted the rise in right wing parties across Europe and how this could cause further disunion. He proposed some ideas from prominent economists on how to save the eurozone and what the future may have in store for Europe. Josh Voges is an Investment Analyst on the Impact Investing team with Catholic Relief Services. He graduate from Fordham University with a M.A. in IPED in 2016. Mr. Voges taught about the purpose of Catholic Relief Services and focused on the work his Impact Investing team did for CRS. He emphasized the importance of a project goal’s sustainability and how his team works to ensure that the community they work with continues to have access to goods, services and/or jobs even without project support. 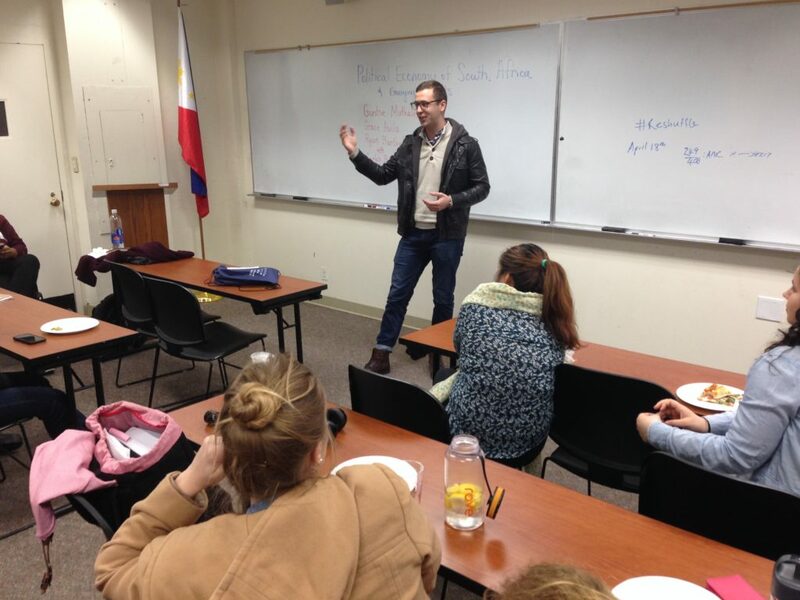 He also shared his experience transitioning from an IPED graduate student into a career with CRS. 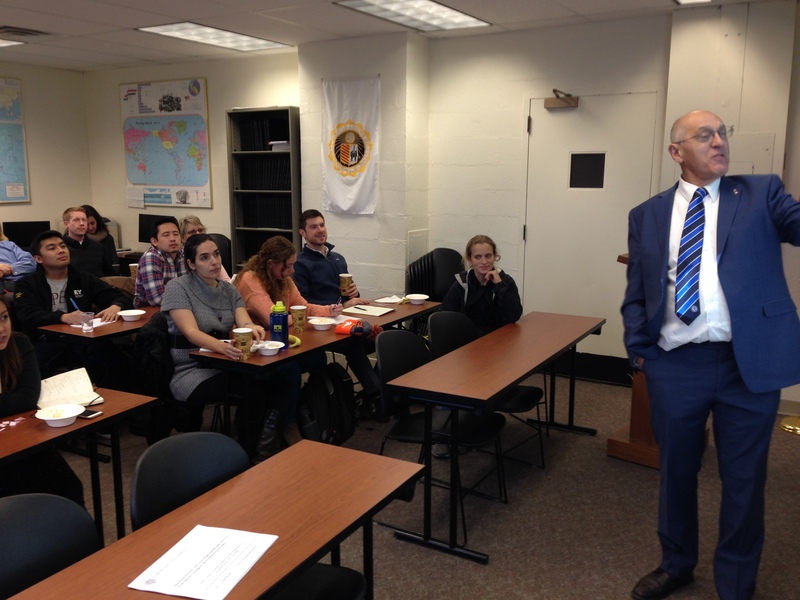 He highlighted the benefits of the CRS internship and International Development Fellows Program. Elizabeth Mahoney is the Head of International Training at the Federal Reserve Bank of New York managing international training seminars and courses on its behalf. 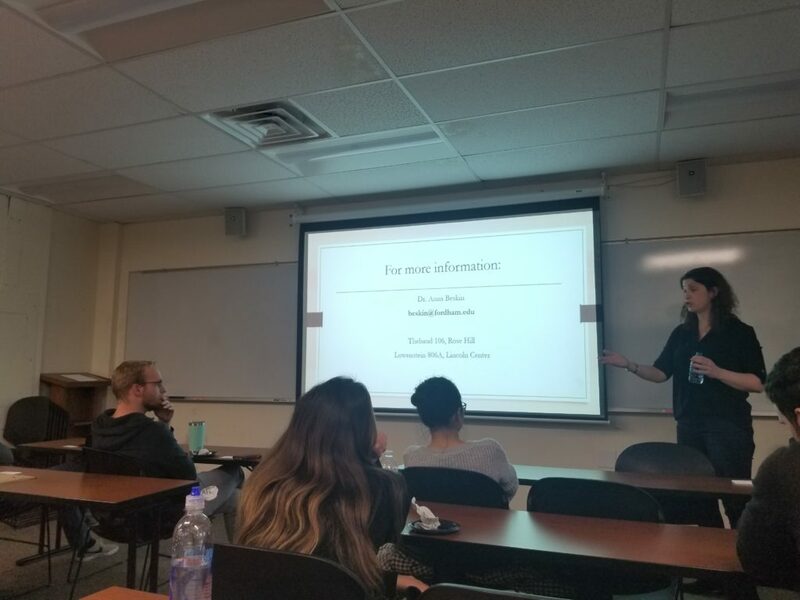 During our lecture, she explained how the Federal Reserve came to exist, the Fed’s structure and the special role that the Federal Reserve Bank of NY plays within the Fed’s framework. We talked about some of the lesser known but interesting responsibilities of the Fed, such as how the Fed monitors commercial banks to make sure they don’t partake in illegal red-lining activities ensuring all qualified borrowers have access to loans. Gregg Streibig is an Investment Manager at Bunge Financial Services and has over twenty years of financial markets experience. Mr. Streibig is responsible for structuring, investing in, and developing alternative investment products for Bunge Financial. We went over the composition of the commodities market, trade flows, pricing signals, and risk management using the production and trade of soybeans as an example commodity. Mr. Streibig taught us how to read a futures contract and then we played a game of his own creation that allowed students to make decisions for a small fleet of freight ships. Ms. Gunjali Trikha is a former Director of Corporate Responsibility for the New York Stock Exchange and is currently an independent consultant in corporate social responsibility and Associate Professor for Marymount Manhattan College. During our lecture, she students discussed what the possible benefits and costs would be if a large supermarket chain moved into a small town. We were able to come up with many of the positive and negative effects that were on her list. We learned more about three particular kinds of corporate social responsibility (CSR), their formation and implementation: strategic, philanthropic and collection action. We also discussed the impact of CSR on the environment and the implications of Amazon planning and then cancelling a facility to a Queens residential area. Ms. Tracy O’Heir, an IPED alumna, from USAID’s Office of U.S. Foreign Disaster Assistance came back to Fordham to teach current students about the structure and purpose of USAID, her own career path and give advice on how to start a career at United States Agency for International Development. 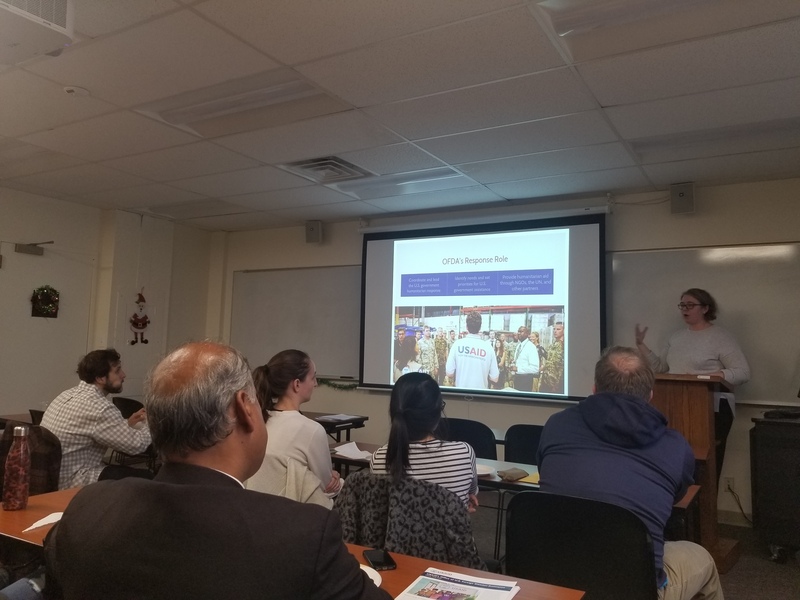 She relayed her experiences working in several African countries, partnering up with various military forces including the US Army and openly answered students’ questions about international aid. IPED and IPE students traveled to the Philippines to learn how to use monitoring and evaluation tools and techniques in order to contribute feedback to the community organizations they worked with. 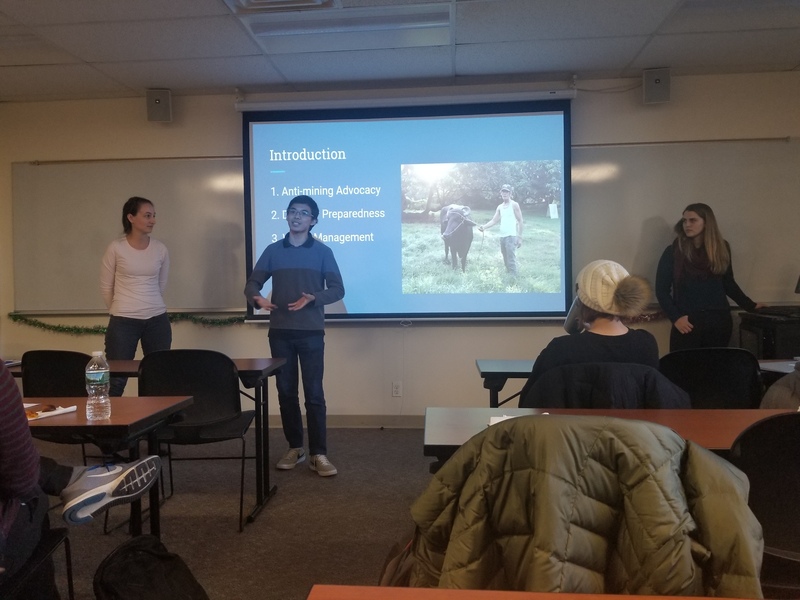 One group analyzed the productivity of an ecclesial community, the second group assessed disaster risk reduction and waste management methods, and the final group worked with a community organization dedicated to sustainable agriculture. During the lecture, students elaborated on their analytical methods, major obstacles and breakthrough learning moments. Ms. Amy Traub is Associate Director of Research and Policy at Demos. Demos is organized around a central mission of fighting inequality in the United States. Demos works for an America where everyone has an equal voice in our democracy and an equal chance in our economy. 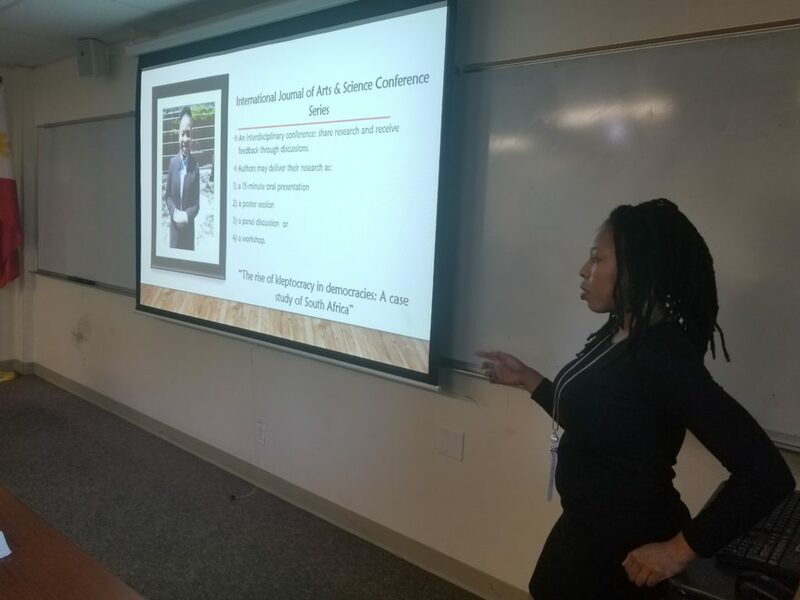 During our lecture she outlined the ways in which they see economic and political inequality as deeply problematic and how both sets of concerns are intertwined with issues of racial inequality. Ms. Traub also gave us a highlight from her own career when their research played a key role in the passage of a presidential executive order raising minimum pay for federal contract workers. 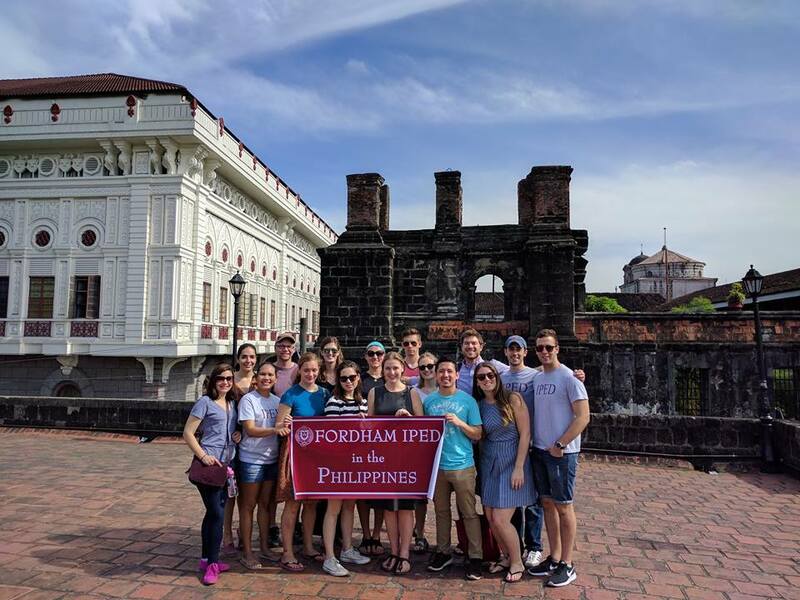 The Office of Prestigious Fellowships here at Fordham University helps students and alumni find and apply to career-advancing scholarships and fellowships. Dr. Anna Beskin is the International Fellowships Coordinator and she came to tell us about international opportunities available to students, share important deadlines and provide crucial advice when applying to certain fellowships/scholarships. We learned about the Boren Fellowship and Presidential Management Fellowship among others. The St. Gallen Symposium is the world’s leading initiative for inter-generational debates on economic, political, and social developments that takes place at the University of St. Gallen, Switzerland. They bring together key decision makers, thought leaders, and brilliant young minds to address current challenges and opportunities on transforming ideas in to action. Valentine Daendliker came to tell us more about the prestigious symposium and the essay competition to win a cash award and a trip to Switzerland to participate in the event. Father Ken Gavin, S.J. came to tell us about his extensive experience working with refugees around the world. He spoke about his work with Jesuit Refugee Service which is an international Catholic organisation with a mission to accompany, serve, and advocate on behalf of refugees and other forcibly displaced persons. He showed us the how JRS works to improve the lives of refugees through job training, job creation, teaching, advocacy for their rights and more. He emphasized the value of “accompanying” the ones you serve by living and working alongside them. We had the pleasure of having Zung Nguyen visit our campus and show us new ways to think about Impact Investing. Zung T. Nguyen is a financial executive with over 30 years of experience in global capital markets, wealth management, product and business development. After retiring from the private sector, he started ZTN Capital Consulting to continue his passion of investing for the greater good. While we’re taught that higher returns come with more risk, he often asks his clients to think about the relationship between risk and impact instead. 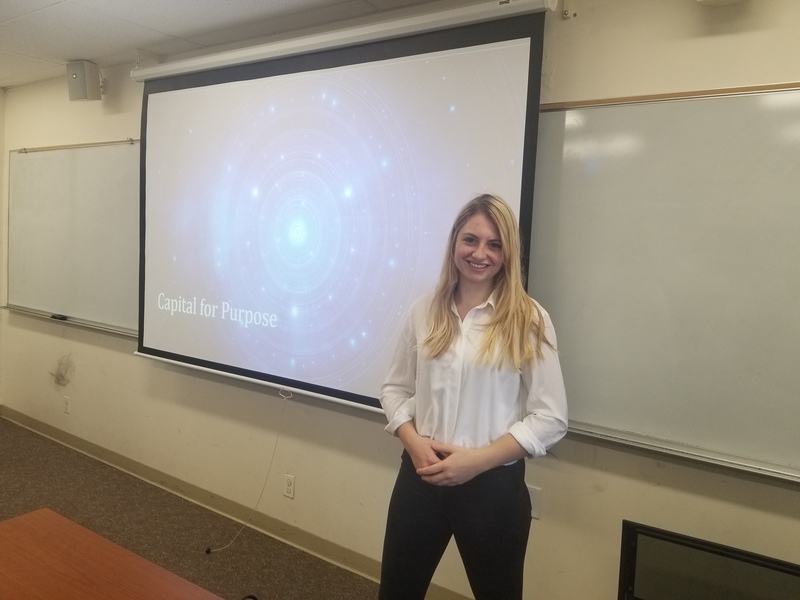 Rachael Kupka, an IPED and Fordham University alumna, came back to tell us about the mission of The Global Alliance on Health and Pollution/ Pure Earth. We learned that there are more deaths caused by different types of pollution than by huge global concerns like AIDS, malaria, tobacco smoking and war. Children and the elderly are always the most vulnerable. She encouraged us to to pay attention to the foods available for consumption, cheap plastics (made into toys and other materials we come in constant contact with) and how we can use their Lancet Report to learn more about the detrimental effect pollution has on human health. Connor Mayes from Burma Task Force gave our students a thorough history of the Rohingya crisis beginning with the history of the minority Rohingya people, through their rising tension with the military, and to the current devastating state of affairs. He gave us an enlightening analysis of how the Rohingya have been physically, spiritually, and structurally diminished at best, destroyed at worst. We learned the names of the people most responsible for the problems, including Myanmar President and Nobel Peace Prize Laureate Aung San Suu Kyi. We also learned how outside actors such as Russia, China and even the World Bank are benefiting from the crisis at the expense of the ones most in need. It was a heartbreaking presentation, but it’s a reality that more of us must face before this group of people can be saved. 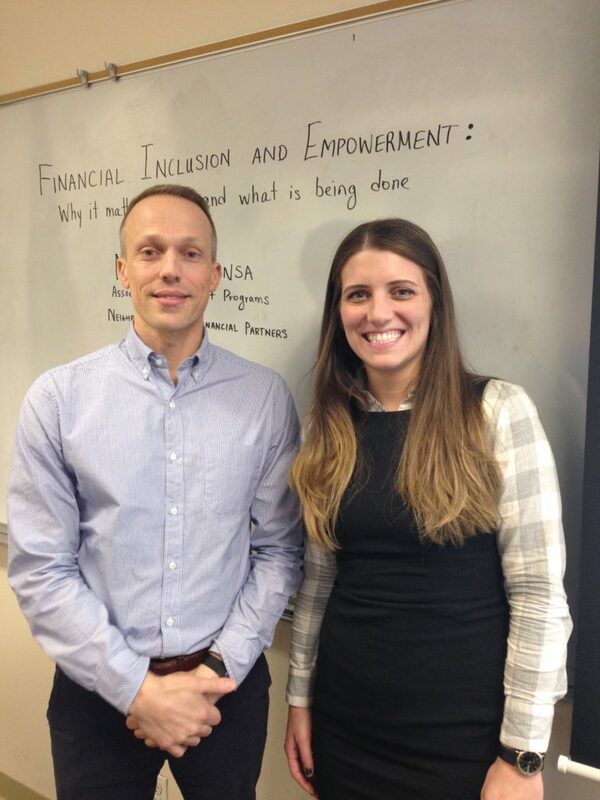 It was such a pleasure to have Jean Ergas, Chief Economist of Tigress Financial Partners, come to our lecture to give us what felt like a boardroom presentation. 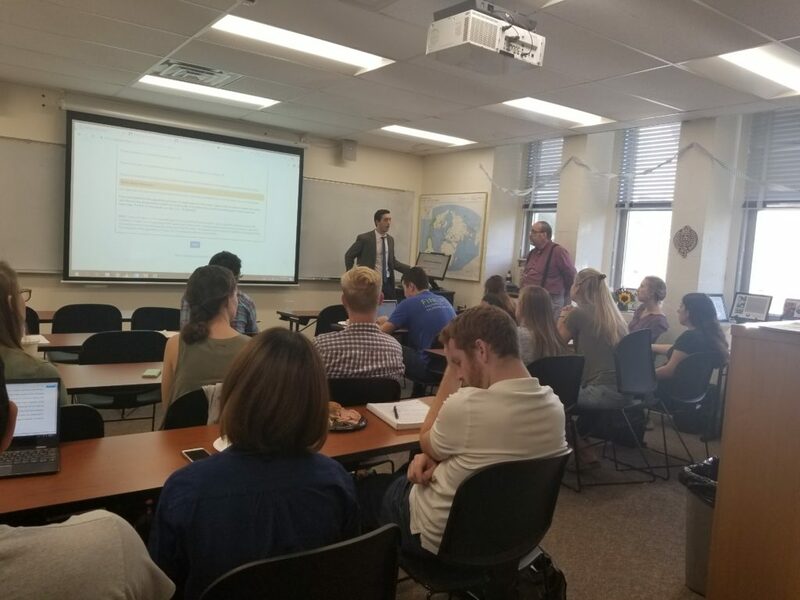 Mr. Ergas took us on a trip around the world, touching on future trade deals between developed nations, tariffs and protectionism, as well as the challenges emerging markets currently and will have to face. 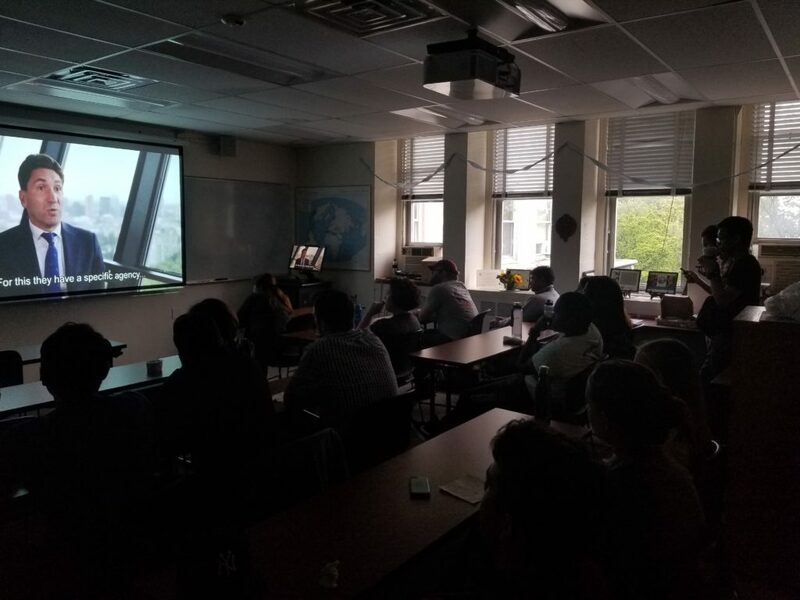 Students came together to watch a documentary about TTIP, a free trade agreement between the European Union and the United States. It was tabled by the current administration last year, but is now being reopened and renegotiated. TTIP: Might is Right focused on the Investor State Dispute Settlement (ISDS) clause of the agreement and the International Court for the Settlement of Investment Disputes, the court that handles ISDS cases. The clause can encourage foreign investment in countries, but it can also allow a powerful corporation to take a country to court. Edward Barbini is a recent Fordham University graduate with a M.A. in International Political Economy and Development and M.A. in Economics. He’s also a 2018 recipient of the prestigious Presidential Management Fellowship. 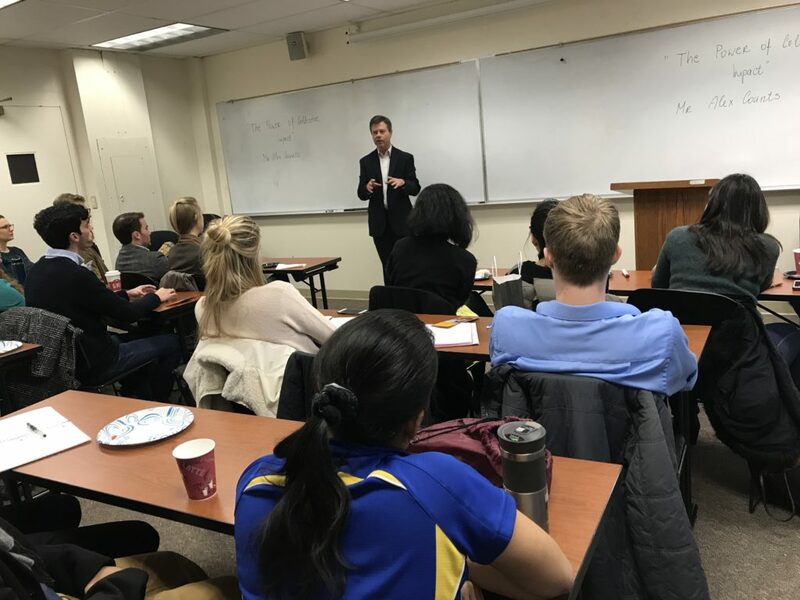 He came back to his old stomping grounds to advise current students on how to successfully apply for this highly competitive fellowship, share his experiences as a PMF Fellow, and talk about life after graduation. 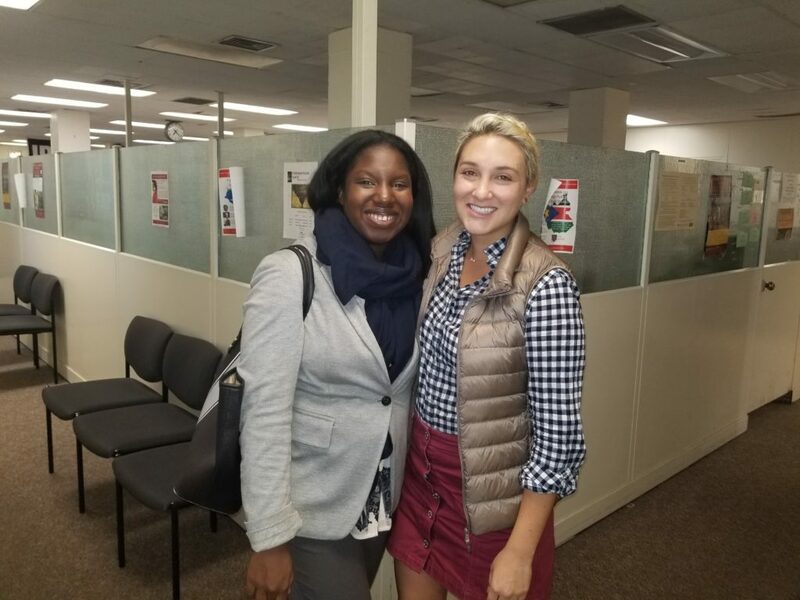 Fatim Lelenta from Career Services visited our students to talk about how their office can help students achieve their career goals. 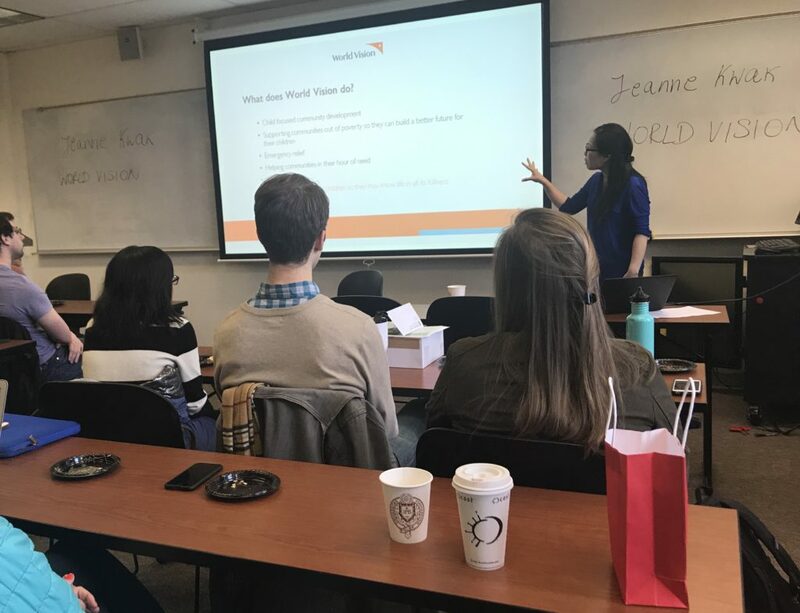 We learned how Career Services can help spruce up a resume, sharpen our interviewing skills, make an unforgettable elevator pitch, network with alumni, connect with industries around the world and more. Here’s a picture of her (left) with an IPED student she personally helped in the past. We also had the pleasure of learning about Global Outerach (GO!) with Paul Francis. He told us about how much students grow, how these service/immersion trips deeply impact them and affect their views on different cultures. GO! does projects in many different countries around the world like Guatemala, India, Haiti and Ukraine. They also do many projects within the U.S.A., for example Nashville, Florida, Alaska and New York City. This week we continued presentations from current IPED students about their summer 2018 experiences. 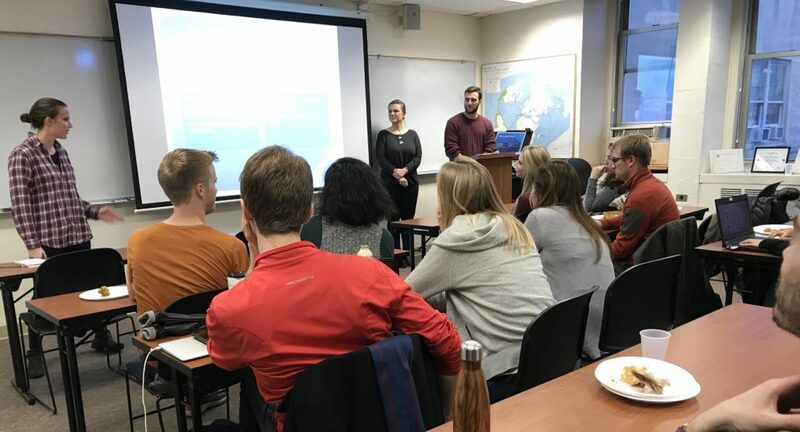 This week we heard about students who interned at humanitarian and sustainability focused organizations such as UNDP, UNICEF, Research in Micronesia and the Center for Economic & Social Rights. 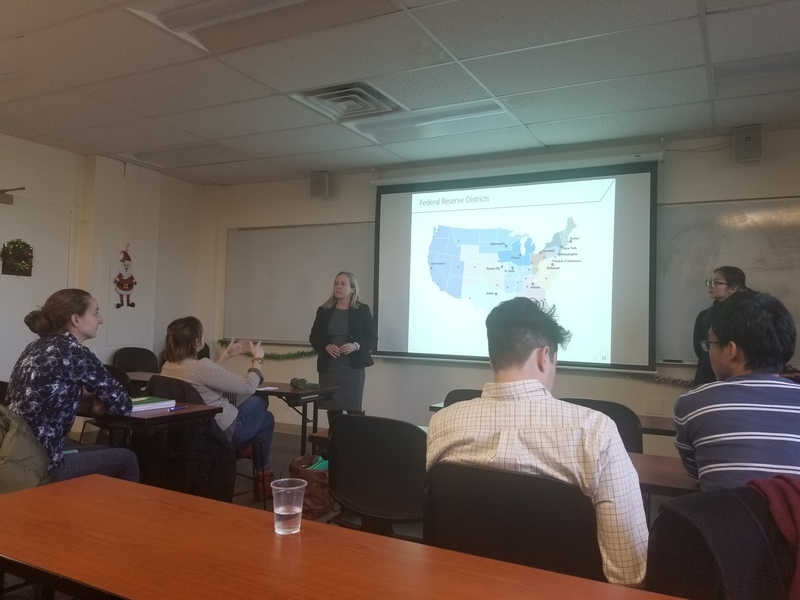 We also had the chance to hear our colleague speak about her experience as a U.S. Borlaug Food Security Fellow at Purdue University learning how organizations are working to reduce hunger and improve nutrition for mothers and children. Thank you for sharing with us! Our IPED students are always on the lookout for opportunities to expand their knowledge and experience the world. Last Thursday, some of them shared how they spent their summers either doing internships or participating in language immersion programs. 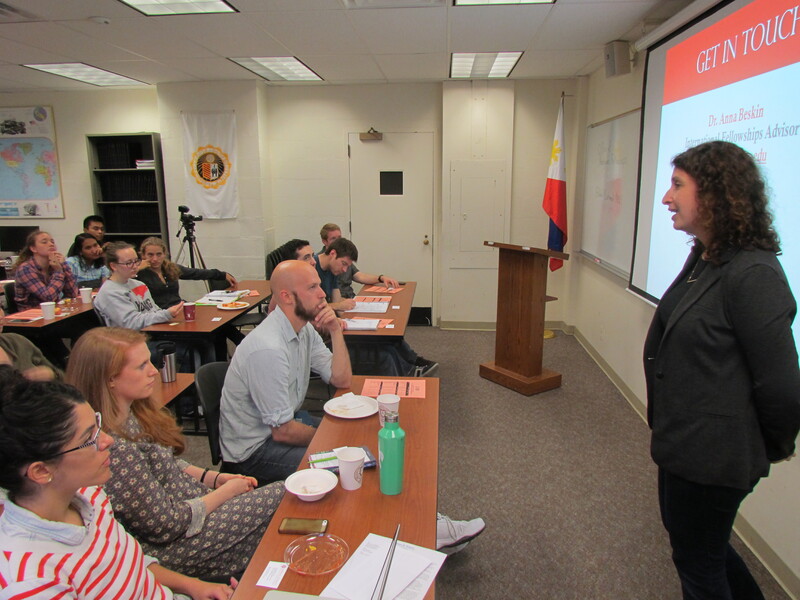 Students interned at organizations such as Finacity, UNDP, and Jesuit Refugee Services in places like Washington, D.C., the Philippines and South Africa. Recipients of the Language Immersion Study Awards told us about their summers improving their language skills in France and Brazil. International Security and Nonproliferation policies in the U.S.
Ms. Joanna Gabryszewski, Senior Foreign Affairs Officer at the Bureau of ISN and Mr. Sterling D. Tilley, Jr., Press Team Chief Spokesman at the Bureau of ISN presented to the IPED students about the topic of international security and nonproliferation policies in the U.S via Skype. What is ISN? What we do and its place in U.S. foreign policy with regard to nonproliferation? 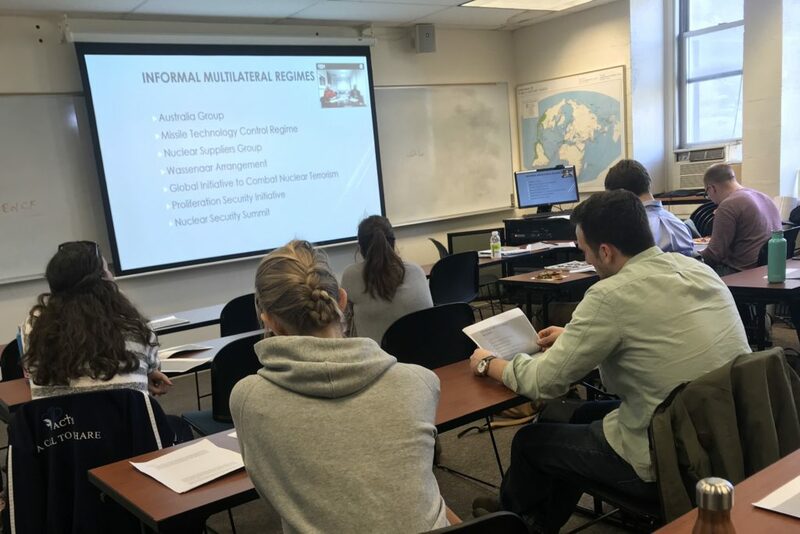 Women in the State Department, specifically in Security and Nonproliferation portfolios: how things have advanced over the past few decades? Lots of buzz in development around private sector engagement, blended finance, and impact investing. 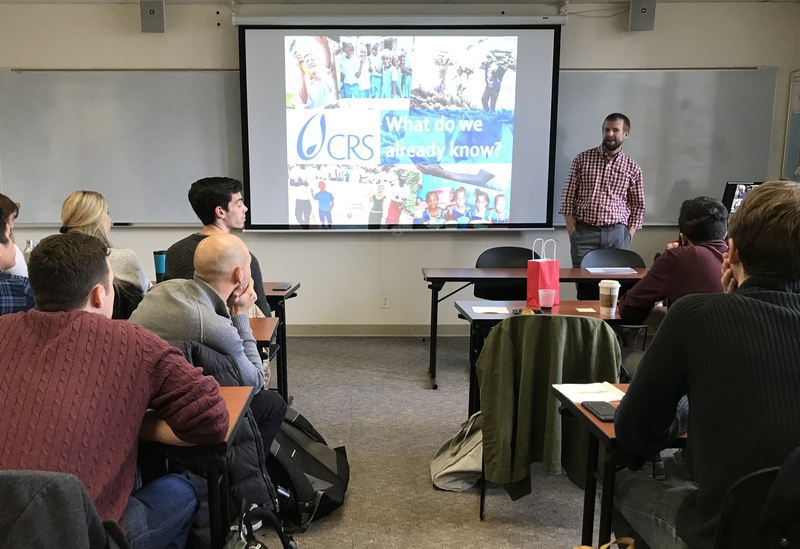 Recent IPED graduate, Josh Voges (’16), led the discussion about how one CRS team is leveraging these mechanisms to support vulnerable communities around the world. Time was also set aside to exchange about his experience as a participant in IPED’s International Peace and Development Travel program and Catholic Relief Services’ International Development Fellows Program. 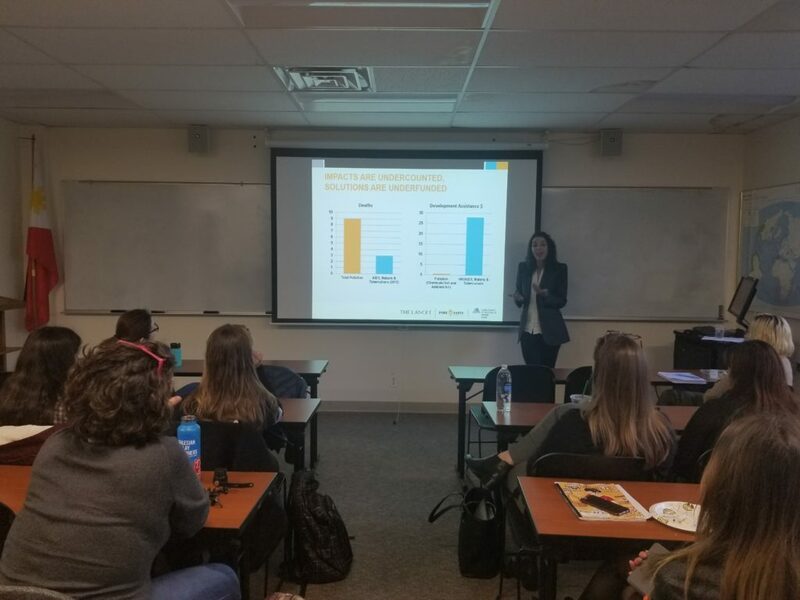 Jeanne Kwak, Communications Advisor for World Vision International, presented about how World Vision conducts advocacy at the global level, particularly around their newest global campaign which has already launched in over 30 countries: It takes a world to end violence against children. She also shared information about the organisation and opportunities for career development. 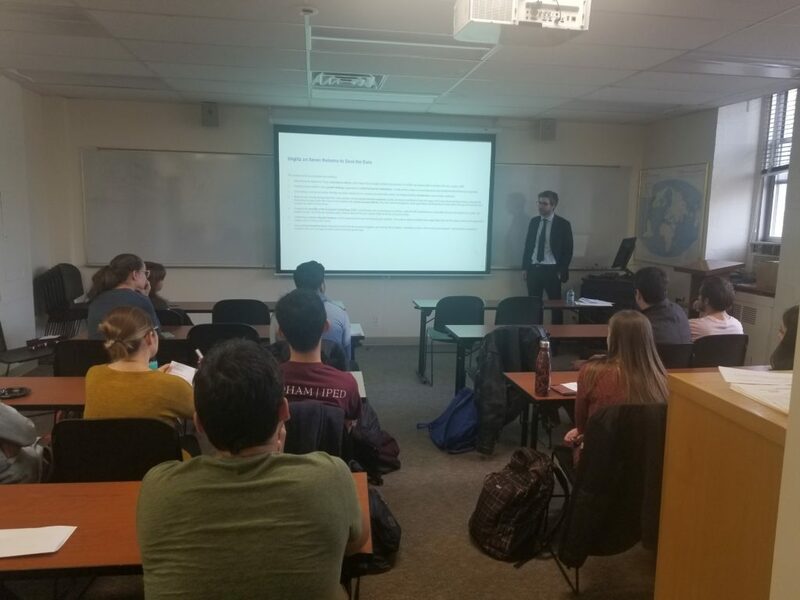 Mr. Martin Miszerak, investment banker and former adviser to the Polish government shared with the Fordham students about the topic of the US policy response of 1989 in Central Europe and its lasting contribution to the business environments of the region. 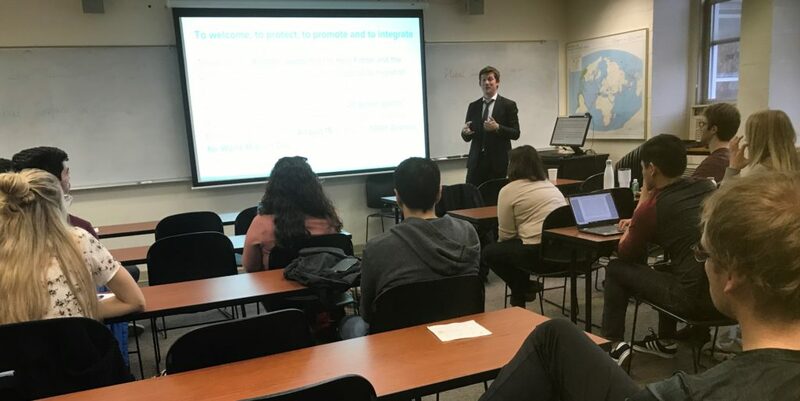 Mr. Timothy Herrmann from the Permanent Observer Mission of the Holy See to the United Nations presented about the politics and intergovernmental negotiations leading up to the negotiation of the Global Compact on Migration. The discussion covered the current debate around the creation of the global framework to achieve safer, orderly and regular migration and the role of the Catholic Church and Pope Francis throughout the process. 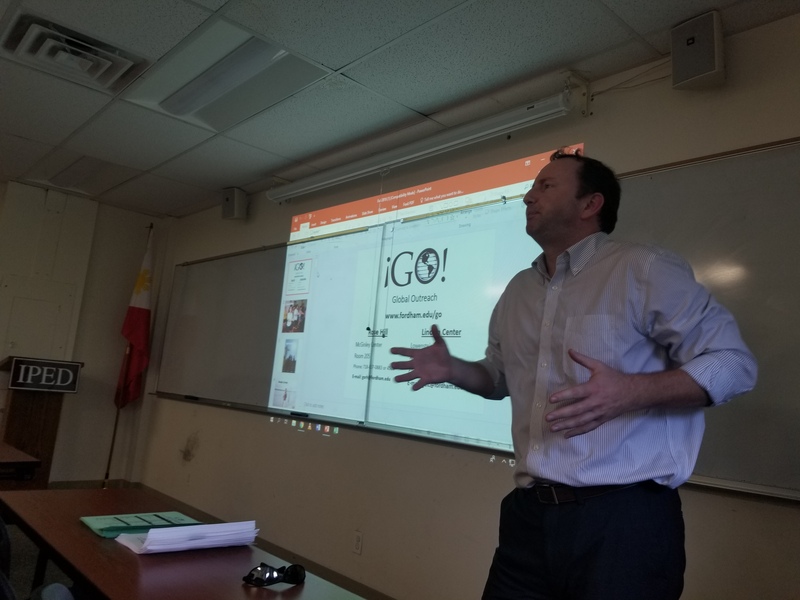 Mr. Gregg Streibig, IPED alumnus’99 presented about the Global Commodity Market, the basic framework and trade flows. Interesting case studies were used as an insight in current trends and developments in the sector. The discussion covered the interpretation of price signals from both the producers and traders perspective , risk management, commodity contracts and financing. 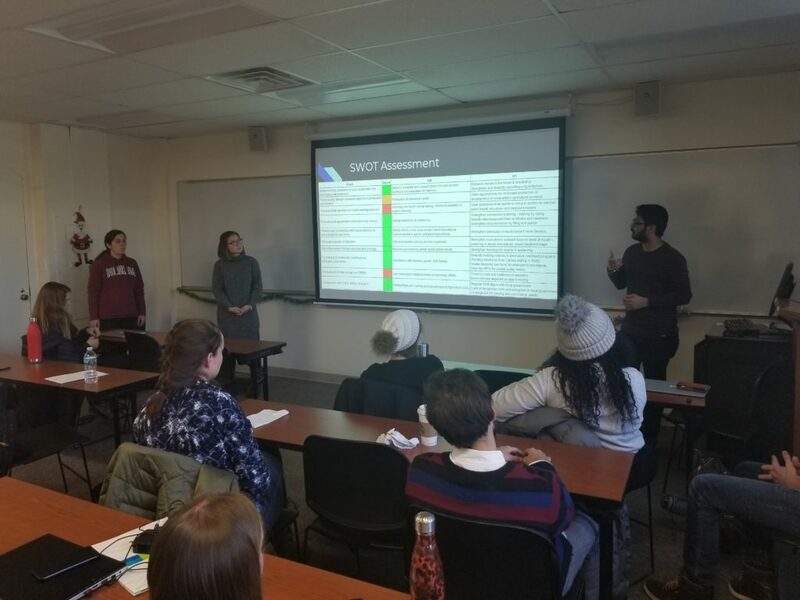 The four Philippines project assessment teams presented their findings and analysis from the Philippines Project Assessment course. The four highlighted projects were about Poro Marine Protected Area, the associated Luto ti Poro Catering Business, Lingsat Marine Protected Area and Kasay Marine Protected Area. 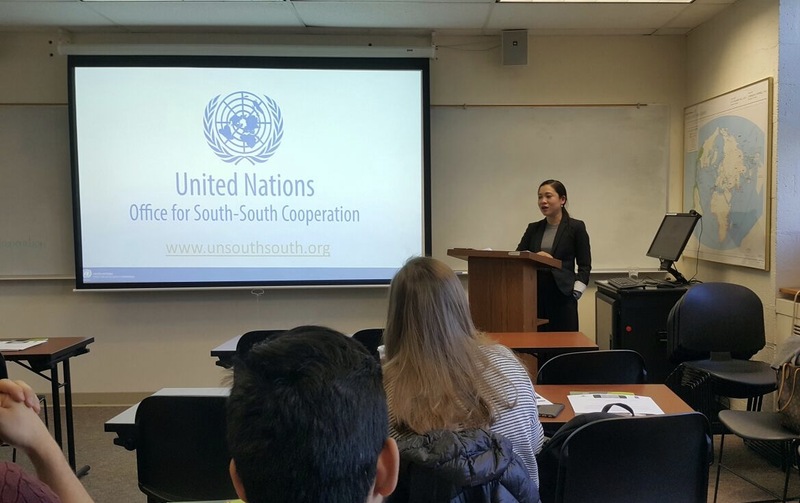 Ms. Sirithon Wairatpanij, the Advocacy Advisor at the UN Office for South-South Cooperation (UNOSSC) Office for Asia-Pacific, Bangkok presented to the IPED students about the “the emerging trend of South-South cooperation and its contribution to sustainable development. 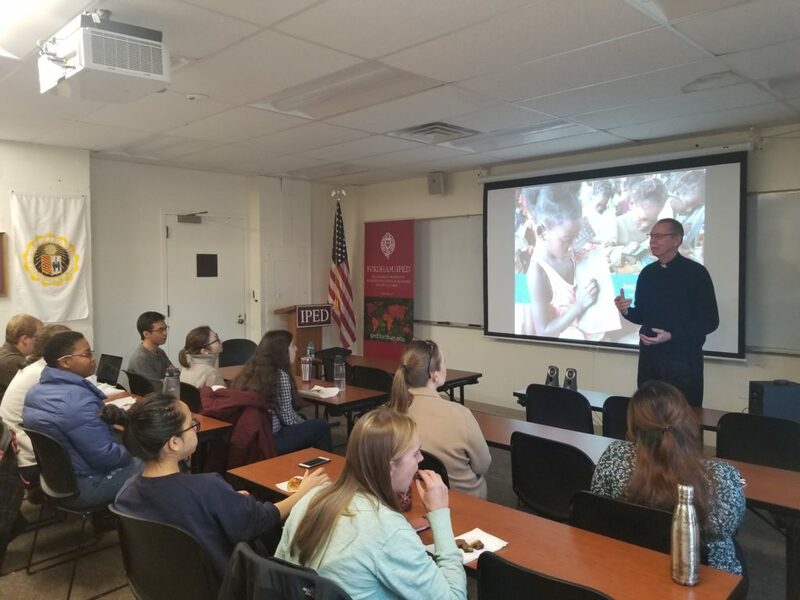 Mr. Alex Counts, founder of the Grameen Foundation and the current president of the American India Foundation presented to the IPED students about topics involving microfinance, a career in “International Humanitarian Work and Social Enterprise” and the concept of “Collective Impact”. The discussion focused around the pivotal role of microcredit and financial services in aiding people living in poverty, the prospects for the future in this field and how community leaders’ embracing of collective approach at the expense of individual agendas is driving progress. 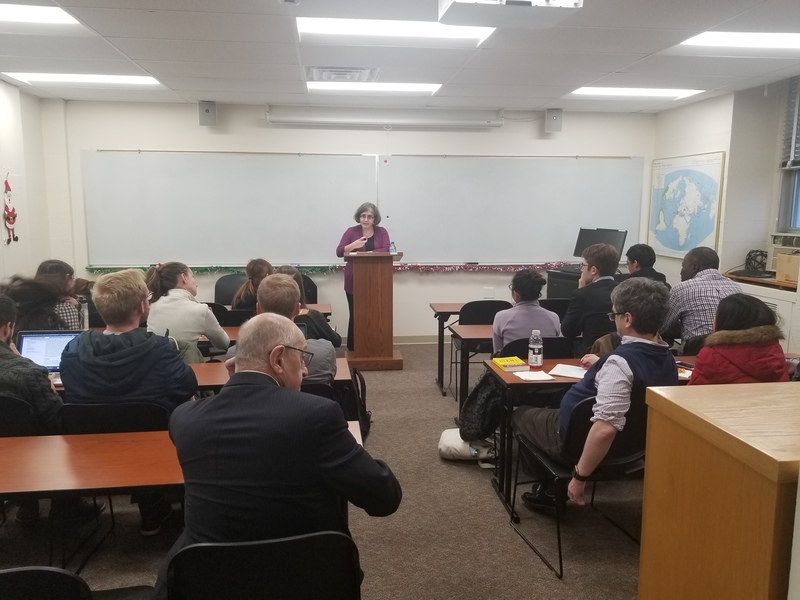 Ambassador Campbell’s presentation to the IPED students focused on the political prospects of South Africa, looking back at its trajectory until now and the current state of affairs. Since the end of apartheid, slow changes in economic and social dynamics have led to the disappointment of internal and foreign expectations. There indeed exist challenges that need to be overcome, however, potential for a hopeful and promising future needs to be acknowledged. 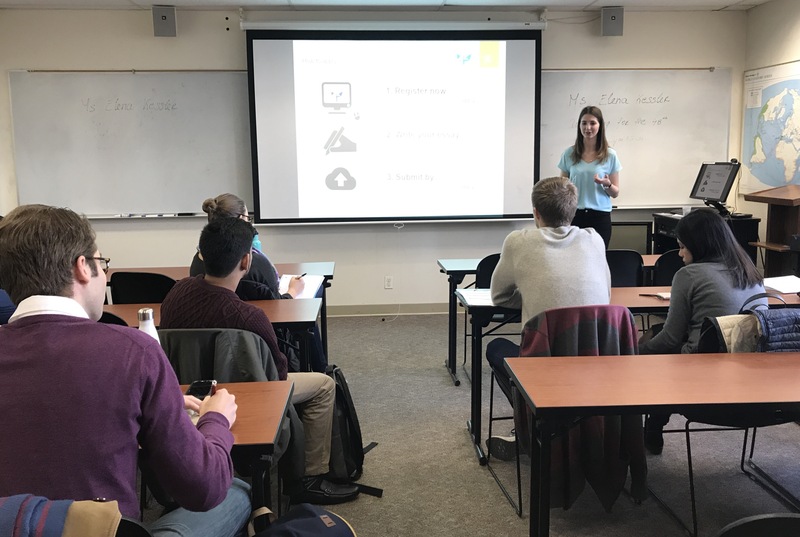 Elena Kessler, member of the 48th International Students’ Committee (ISC) presented to the IPED graduate students how they can compete for a free participation in the St. Gallen Symposium and qualify as “Leaders of Tomorrow”. Further information on the student initiative and the topic of the 48th St. Gallen Symposium: “Beyond the end of work” can be found on www.symposium.org. Dr Ishmael Nii A. Dodoo, Regional Strategic Oversight Advisor to the Office of the Assistant Secretary General/ Regional Director of the United Nations Development Programme- Africa presented to the IPED students about the SDGs’ implementation status so far within the context of the political economy of Africa. 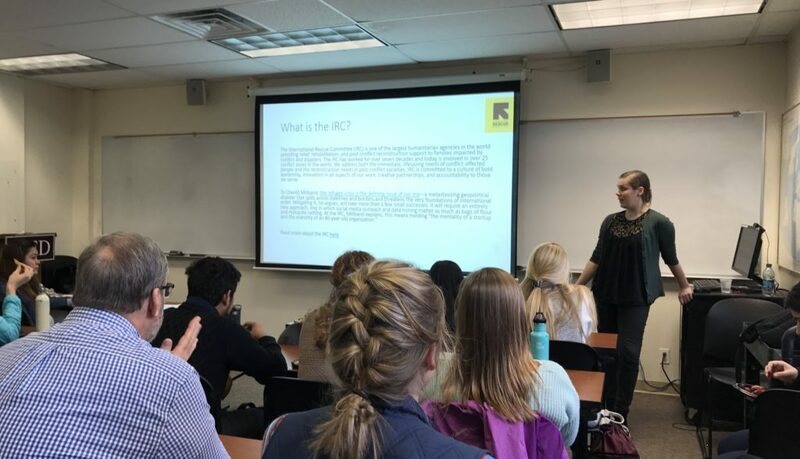 Liz Parr, IPED alumni and now the Digital Data Manager in IRC’s Economic Recovery and Development Technical Unit presented to the IPED students about her job hunt experience in New York City, largely centered on analyst-type opportunities in the global development/ humanitarian space. How does the third largest agri-business in the world ensure profitable growth, while protecting the environment and supporting farmers and communities? With the world’s population expected to reach 9.8 billion by 2050 sustainability is gaining gargantuan significance. Mr. Camilo Sanchez, the head of Corporate Responsibility and Sustainability at Olam International presented to the IPED students about production in a manner “that is socially responsible, economically profitable and environmentally sustainable” and a career in the private and public sector in relation to sustainability. The presentation focused on Olam Coffee’s sustainability strategy, current status and vision for the future, its compliance with international frameworks such as the 17 Sustainable Development Goals. Additionally, the presentation covered topics such as the relevant standards & tools (e.g. Supplier Code, Olam Livelihood Charter), various sustainability projects and the relationship between important players in the field, such as private sector, donors, NGOs. 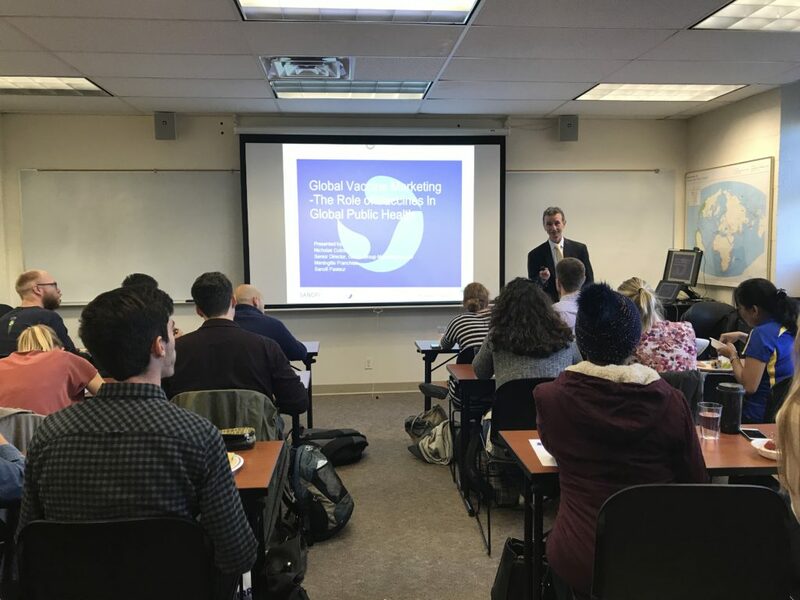 Mr. Nick Cutrone, the Global Franchise Group Leader for Sanofi Pasteur Vaccines presented to the IPED students about the global vaccine industry. The IPEDers had the chance to learn more about the evolving political and economic issues facing both manufacturers like Sanofi Pasteur, as well as policy makers and health ministers in the global marketplace. The presentation touched upon the various challenges faced by the industry, such as research and technology challenges, as well as, regulatory hurdles and the important players in the business. Furthermore, they discovered an interesting tool on Gapminder, making graphic presentations more original and colorful. Furthermore, Dylan Katz from Global Outreach (GO!) spoke to IPED students about leadership opportunities on GO projects. Global Outreach (GO!) is a cultural immersion and service program under the auspices of the Office of Mission Integration and Planning at Fordham University, where students learn about various issues of social, economic, political and environmental injustice while living a simple lifestyle that fosters communal and spiritual growth. The documentary comprehensively and objectively tackles critical questions about China with important implications for the world, focusing on China’s ever-growing power on the international stage. It achieves the latter, by amongst others entering the daily life of teachers, merchants, factory workers and the like and considering the Chinese’s attitude towards their new, dynamic and developing environment and the communist party’s leadership. 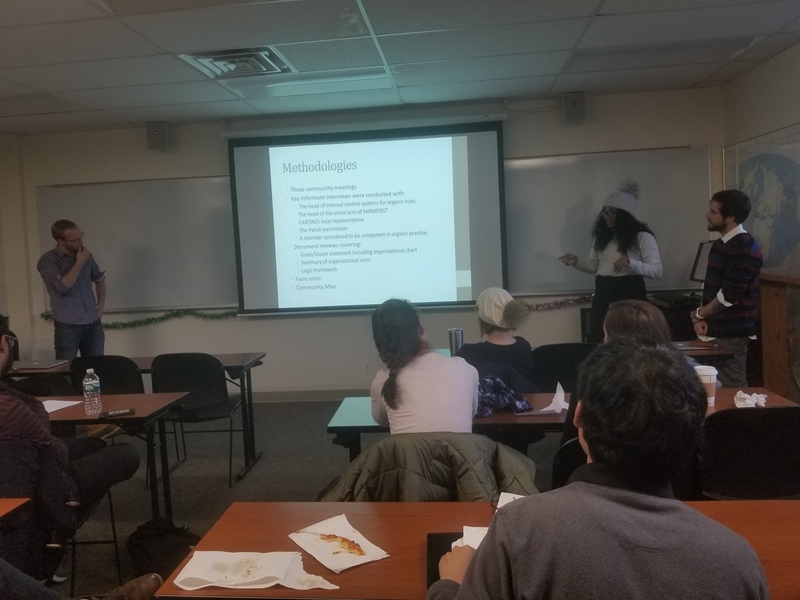 An interesting Q&A session followed the presentation during which the students had the opportunity to learn more about typical misconceptions about the Chinese culture that exist in the Western world and factors to be considered when doing business with the Chinese. 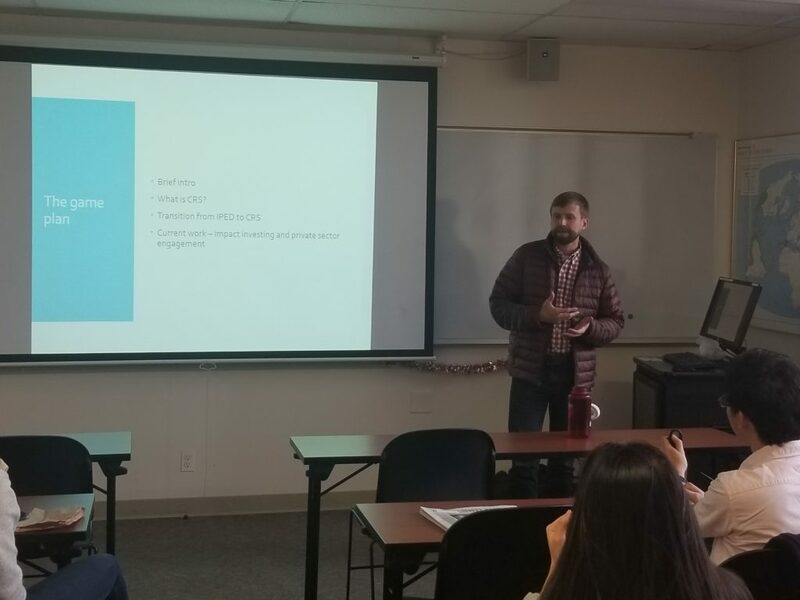 Bradley Dawson, a policy advisor for food assistance/food security at World Vision International (WVI), spoke to IPED students about WVI writ large, his role within in the organization, and career opportunities for students. WVI’s mission is “to follow our Lord and Savior Jesus Christ in working with the poor and oppressed to promote human transformation, seek justice and bear witness to the good news of the Kingdom of God.” They work for the sustained well-being of children, with extensive reach in arenas such as gender, child protection, nutrition, and disaster management. WVI offers an internship program, in three cohorts, fall, spring, and summer, in its major cities of operation in the United States including New York. Students who apply may continue taking courses in IPED while pursuing an internship 2-3 days per week. 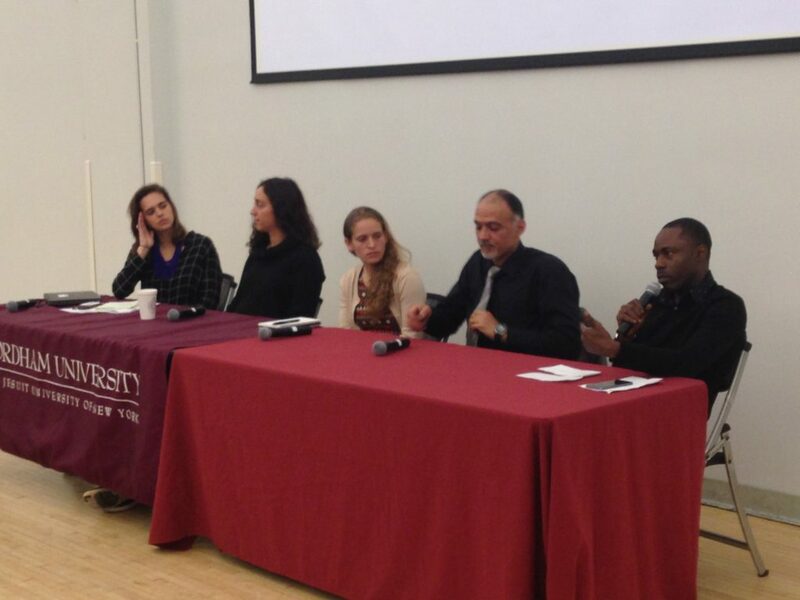 IPED co-hosted the panel discussion “Seeking Refuge in New York” with Fordham’s International Institute of Humanitarian Affairs (IIHA) Thursday at the Rose Hill campus. 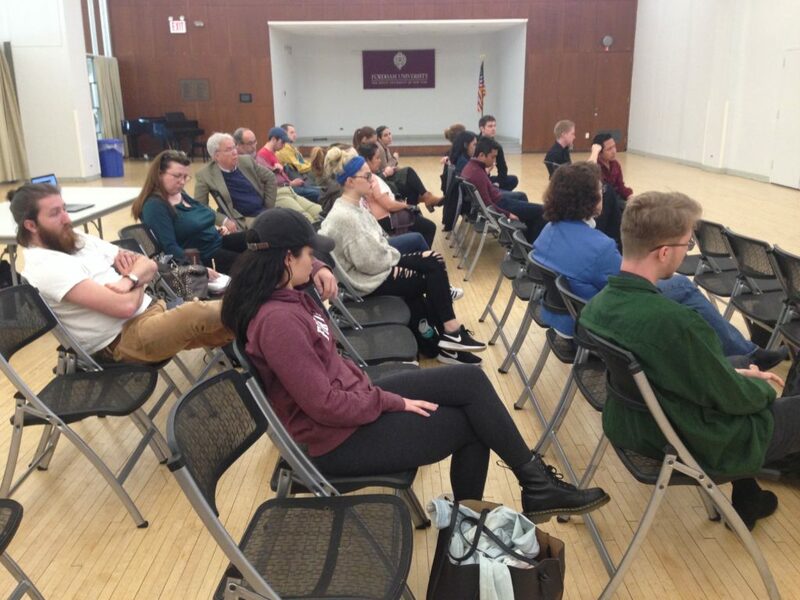 Two men currently seeking asylum in the United States as well as representatives of two New York based organizations, Refugee and Immigrant Fund (RiF) and RDJ Refugee Shelter participated in the panel discussion. Audu and Ahmed, asylum seekers from Nigeria and Libya respectively, shared their thoughts on the asylum-seeking process as well as living in New York City. The process is often a tortuous route with opaque directions and a complex web of organizations, agencies, lawyers offices, and shelters. Because asylum seekers often must leave their countries on very short notice, it leaves little time to prepare for life in the United States, much less for the long and complex asylum seeking process. While organizations such as RiF and RDJ exist to provide direct services and referrals, Audu and Ahmed stressed the importance of having people to come alongside men and women as they traverse the asylum process. There are opportunities for college students to help fill out forms, accompany people to appointments, and simply hang out and be a friend. For volunteer opportunities check out RiF and RDJ. As lecture dates are scheduled weeks in advance, current events aren’t always part of the calculus. And so when we invited Ambassador John Campbell, the Ralph Bunche Senior Fellow for Africa Policy Studies at the Council on Foreign Relations, to speak on the Political Economy of South Africa this week, little did we know how relevant it would be. So with the sacking of South Africa’s Finance Minister Pravin Gordhan over the weekend, Ambassador Campbell was summoned to brief congress in Washington, D.C.
Lucky for IPED, we have our own resident experts. 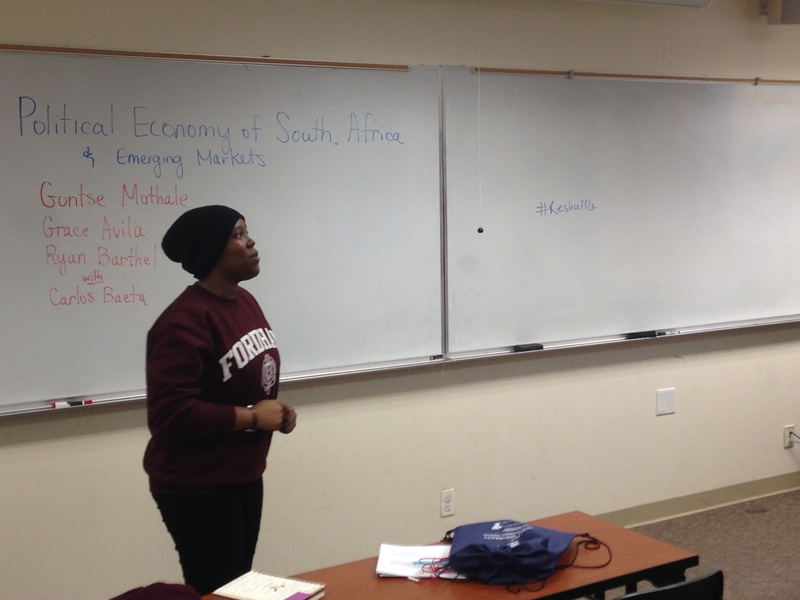 Gontse Mathale (Economics, ’17) and Carlos Baeta (IPED ’17, Economics ’18) provided background and analysis for students on the current political economy of South Africa. Notably, President Jacob Zuma faces a vote of no confidence set for April 18. That the result of the upcoming vote is unknown speaks to the falling popularity Zuma enjoys among members of his party, the African National Congress (ANC). Students will be watching events in South Africa closely over the coming months as they prepare for the Emerging Markets: South Africa course to be held in Pretoria in August. Mark Thompson, the Chair of the Opportunity Global Board, spoke to IPEDers about the role micro-lending plays in development. Active in 24 countries, Opportunity International (OI) is currently partnered with 39 microfinance institutions. Services provided include financial advice, trust groups, and training. Areas of key focus are agriculture finance, education finance, leadership development, technology, and women. In providing micro loans, OI follows a model based on trust groups. To make lending small amounts of money viable for a private firm, loans are pooled and given to a group of borrowers within a community. This way, group members keep each other accountable for repayment, and microfinance managers are able to maintain a relationship with borrowers more easily. While American staff of micro-lending organizations based abroad are thin, there are many organizations involved in microfinance. Other organizations to look to include FINCA and Kiva. These are the goals city planners of the 21st century must strive for. But just who is a city planner? 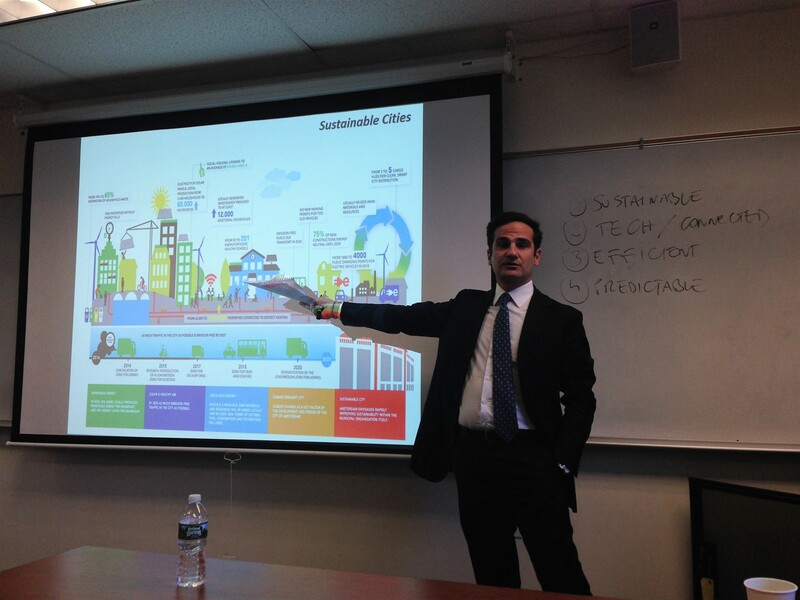 Dr. Carlo Vermiglio, an Assistant Professor of Business Administration at the University of Messina provided a bold assertion for city planning today. Beyond simple statements and goals for city initiatives, Dr. Vermiglio posited that the most important objective for any city is preparedness. Mitigating the effects of potential disasters–a goal informed by the devastation caused by earthquakes in Italy–is the single most important thing a city can do to stay viable. Because of this, the work of city planning is designated for a wide variety of stakeholders beyond traditional city planner roles. His assertion led to lively debate among IPEDers who were attending the lecture. It is often difficult to attribute successful mitigation of disasters since it is tough to measure what hasn’t happened. However, it is also difficult to overstate the costs associated with famines, floods, and other natural disasters that can overwhelm city budgets and wipe out growth potential. As an interdisciplinary program, IPED offers coursework in economics and political science, but it also offers an elective in sociology. Classical Social Theory is offered in the fall semester and taught by Dr. E. Doyle McCarthy. Dr. McCarthy specializes in the sociology of knowledge and culture and emotion studies. Her lecture, titled, “What is Knowledge Today?” offered a provocative challenge to think about how we as a society create and share meaning in a digital age. “Today’s social knowledges,” said Dr. McCarthy, “that come to us via digital media and technologies are not only informational or idea-based, they also communicate to us…our identities.” Because of the many new digital platforms for communication, knowledges are not easily located within particular classes or institutions, as they have been in centuries past. Meanings today are shared in multi-faceted ways, and individuals across age groups, geography, and social classes communicate directly. While research in this new phenomenon is nascent, new knowledges are possibly playing an important role in political movements globally. 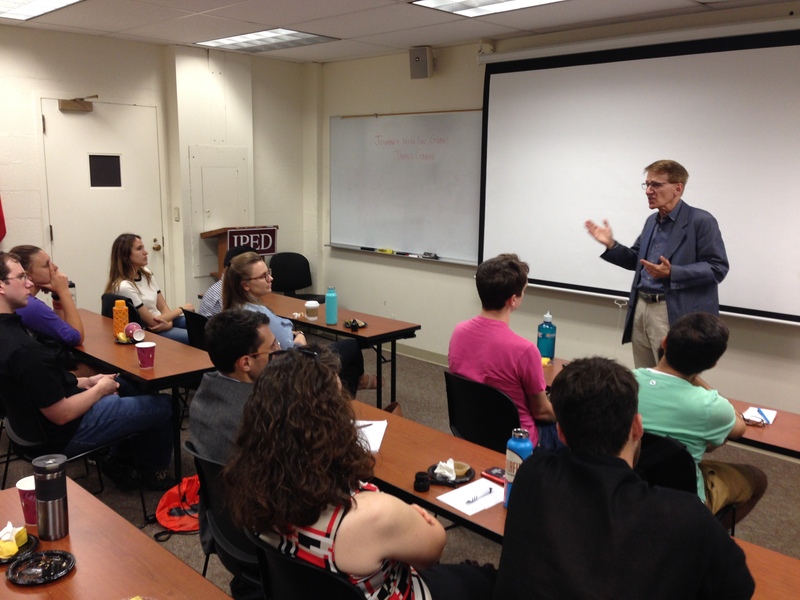 Dr. McCarthy explored the differences between revolutionary social movements and reactionary social movements. New movements within the political right may display counter-revolutionary politics, which is fundamentally different than revolution. 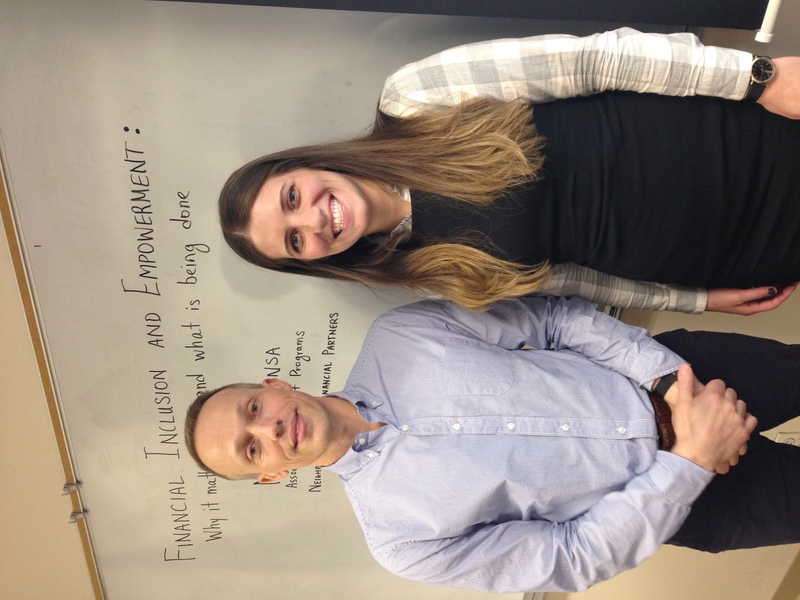 IPED Alumnus Matthew Konsa joined us today to talk about the role of financial services in community development. Matthew is the Associate Director of Programs at Neighborhood Trust Financial Partners, located in Manhattan. There he oversees a team that advises New York residents on topics from financial literacy to accessing eligible programs in the city. He was joined by our very own Samantha Kinney who is a Financial Counselor with Neighborhood Trust. It was great to learn more about her leadership in community development. Dr. Robert Brent, a professor of economics at Fordham University, delivered a presentation on the Fordham Francis Index (FFI) and considerations for its next iteration. 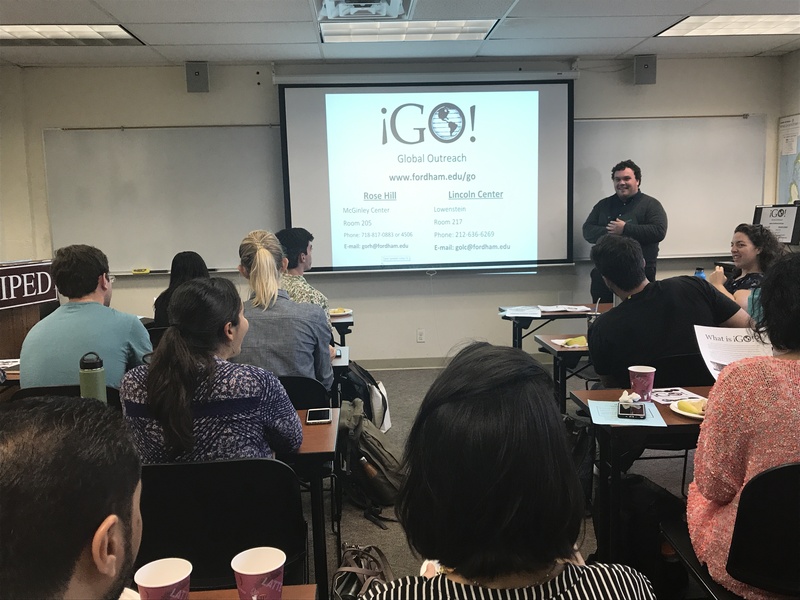 Students in the Foreign Aid and Development course taught by Professor Henry Schwalbenberg, the director of the IPED Program, are currently working on updating the index that was created during spring semester, 2016. 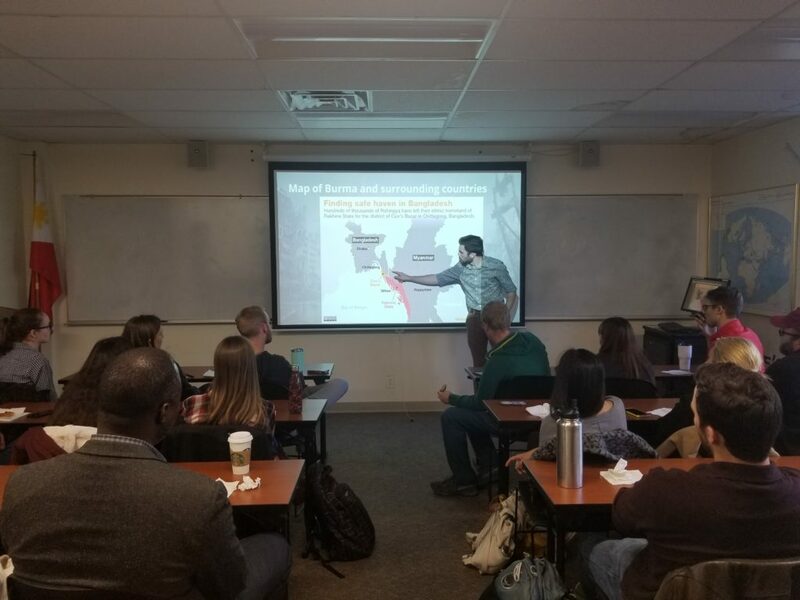 Dr. Brent’s lecture included technical suggestions such as searching for a measure that combines the effects of water with other correlated variables. 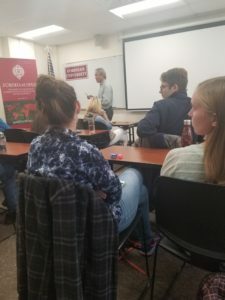 He also encouraged students to take a fresh look at the overarching goal for the FFI and to consider a possible index entirely composed of a spiritual measure. While other multidimensional indices have been developed in recent years (such as the UN’s HDI and Dr. Sabina Alkire’s MPI), the FFI offers the unique spiritual dimension. 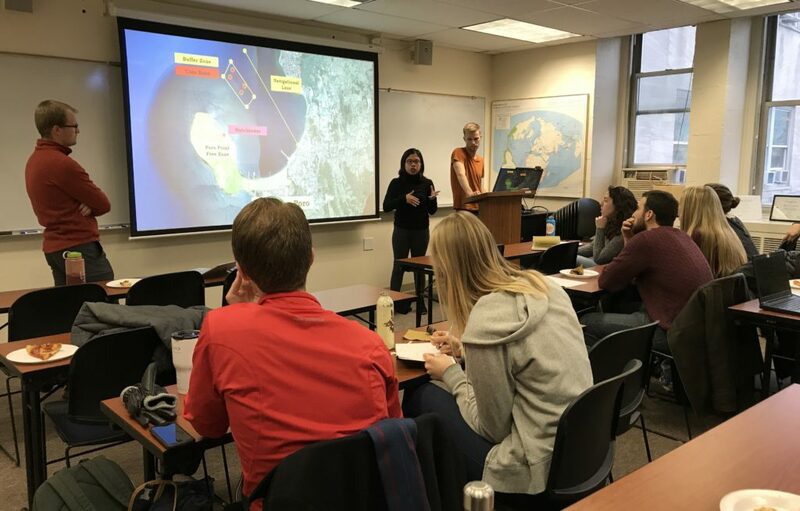 Sixteen students presented their field research and recommendations today as part of the IPED Lecture Series. Divided into five groups, students spent three days living in local communities in Mindoro, an island just south of Manila. There they evaluated projects, cooperatives, and organizations in order to provide communities with suggestions for best practices. Stay tuned for videos from the field as well! 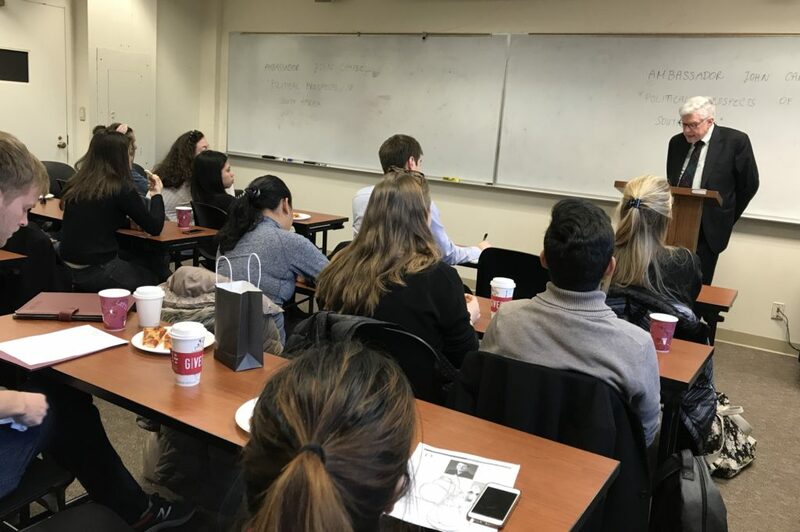 Students in the IPED program had the chance Thursday to learn about all the ways Fordham University works to help propel grad students into careers after graduation. 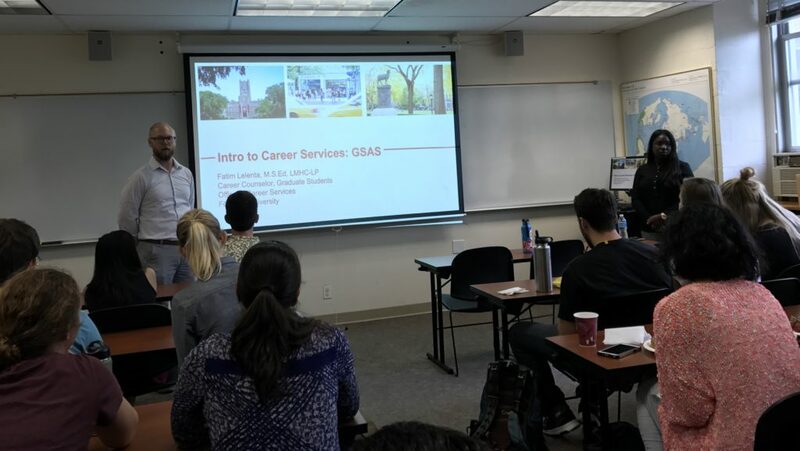 Making the trek all the way up to Rose Hill, Fatim Lelenta, the GSAS and GSE Counselor, delivered a comprehensive look at the ways grad students can take advantage of what the Career Services office has to offer. The list is extensive. 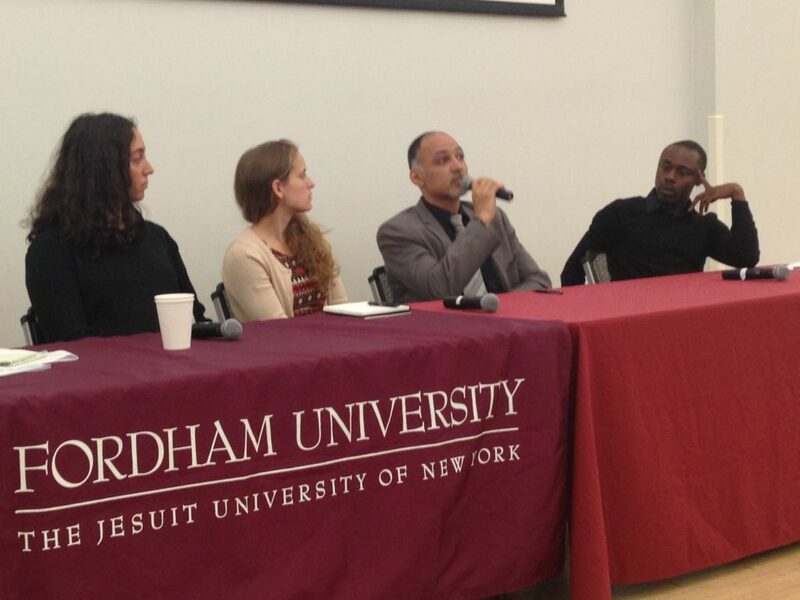 Students are encouraged to visit Fordham.edu/career to make use of job postings and interview practice software. Thanks again to Fatim for her dedication to the future success of IPEDers! 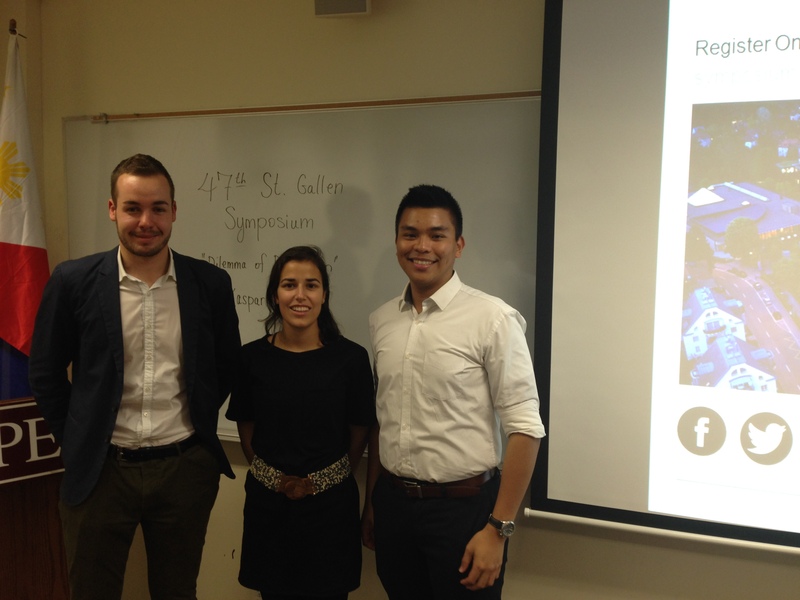 Kaspar Koechli, a student from St. Gallen University, met with IPED students to share this year’s theme for the St. Gallen Symposium. The three day event held in May, 2017 brings together thought leaders from around the world. One hundred students can qualify to participate in plenaries and discussion groups. Even more exciting, six finalists will be chosen to present their idea this year to global leaders on the topic the “Dilemma of Disruption.” Applicants must share their ideas on how to break the status quo–and challenge the things we implicitly take as given. Fordham students have a track record of success at St. Gallen–last year IPED sent three students, including last year’s “Wings of Excellence” winner, Schima Labitsch! Watch the video below for more information on how to apply. 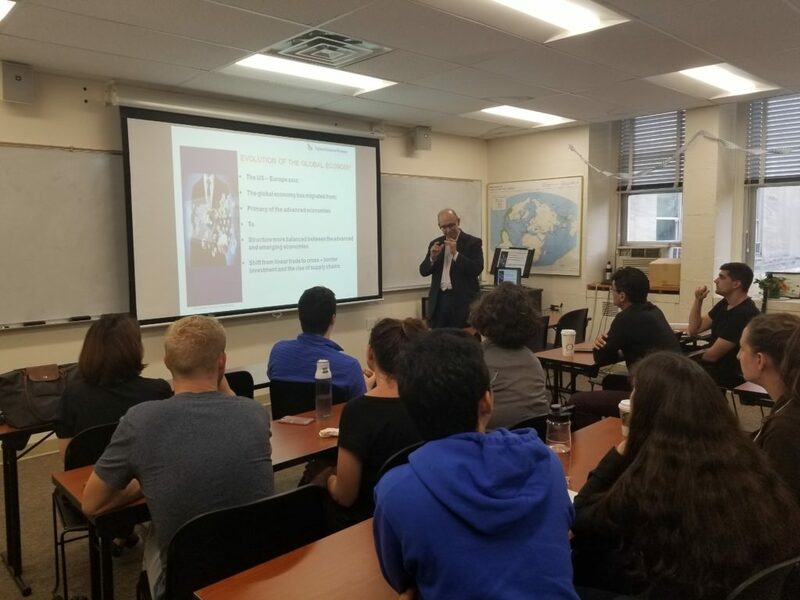 Dr. Jose Cerro, a professor and researcher in the Department of Business Studies at Universidad Iberoamericana in Mexico, spoke with IPED students about population, income distribution, and policy considerations for a growing world. Educated in Argentina and Minnesota, Dr. Cerro’s career spans almost five decades as a professor and researcher all over Central and South America. 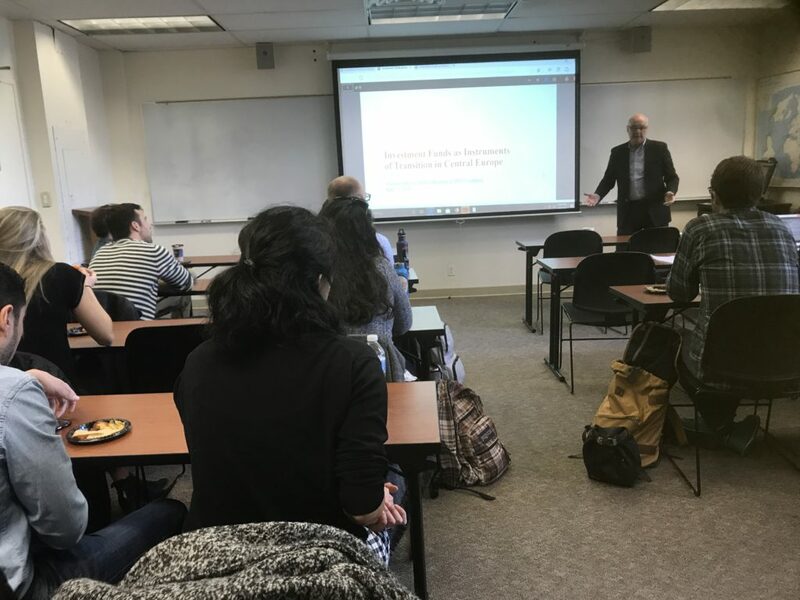 In an engaging discussion, Dr. Cerro spoke at length about indicators for development, highlighting the challenges in comparing diverse countries. For example, thirteen countries have over 100 million people, while 35 countries have less than 1 million. Qatar boasts PPP GDP per capita of $130,000 while four African countries have less than $1,000 each. Income is distributed within countries as well as across the globe. Eleven main global priorities were enumerated–things such as energy, agriculture, trade, and financial architecture, as well as food, water, and growth–showcasing the complex and interrelated challenges development faces today. Finding solutions within these dynamics is the challenge policy makers face in this ever growing and complex world. 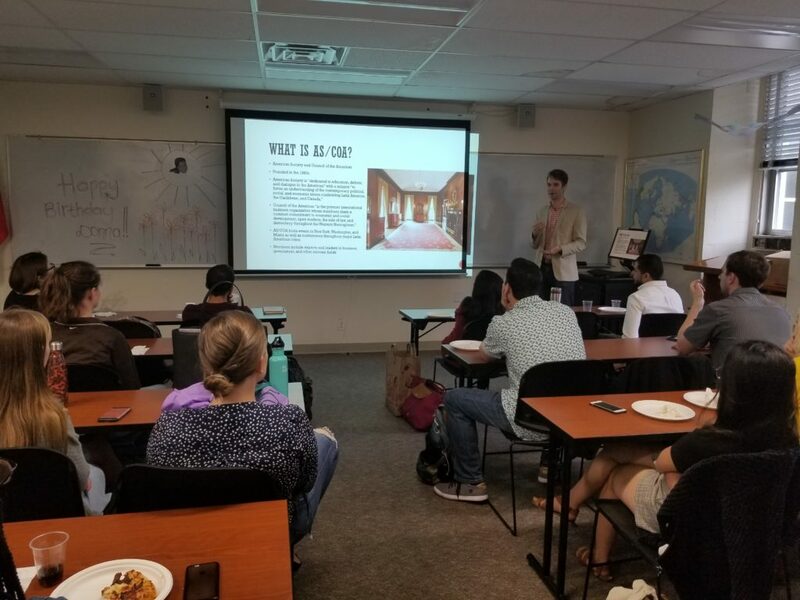 Daniel Bernstein, Deputy Director of BID, spoke with students about the organization and its development work in the neighborhood next to Fordham University’s Rose Hill campus. Particular activities of interest including art installations (if you haven’t seen it, check out “Heart Bench” on the NE corner of Fordham Rd. and Webster) and movie showings in Fordham Plaza. We also had the pleasure of hearing from IPEDers Andrew Wilhelm and Erika Cox about their experiences as interns with BID and the good work they do there. If you are interested in learning more about any of these opportunities, you can view the presentations below. Dylan Katz from Global Outreach (GO!) 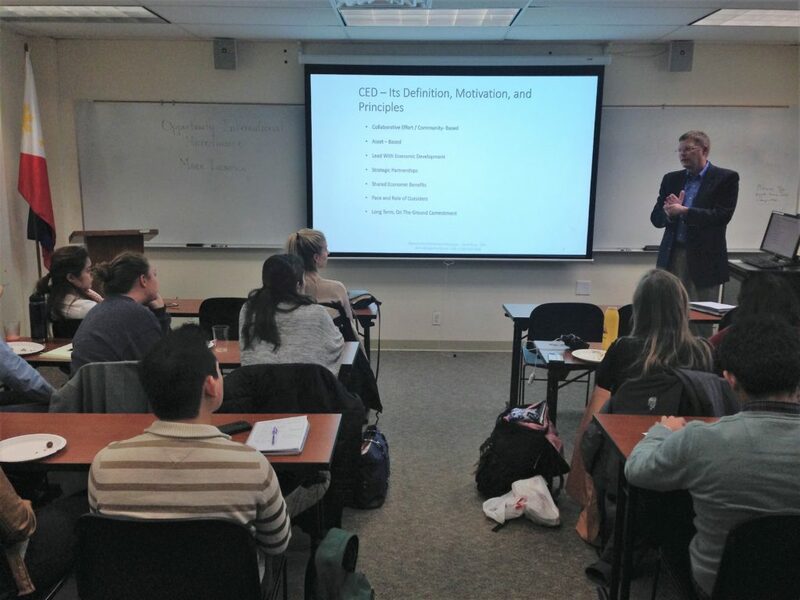 spoke to IPED and IPE students about leadership opportunities on GO projects. Global Outreach (GO!) is a cultural immersion and service program under the auspices of the Office of Mission Integration and Planning at Fordham University, where students learn about various issues of social, economic, political and environmental injustice while living a simple lifestyle that fosters communal and spiritual growth. Dr. Anna Beskin from the Office of Prestigious Fellowships informed on opportunities for fellowships and language immersion programs. Deadlines are fast approaching for most programs. Please visit the website for more information, and to schedule an appointment for advising. 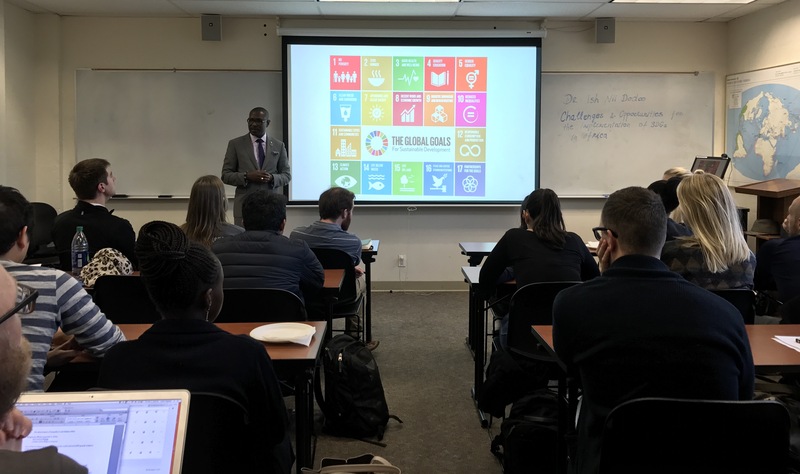 Ambassador Choonghee Hahn, Deputy Permanent Representative of the Republic of Korea to the United Nations in New York, spoke to Fordham students about the UN’s Sustainable Development Goals (SDGs), emphasizing the role youth can play. 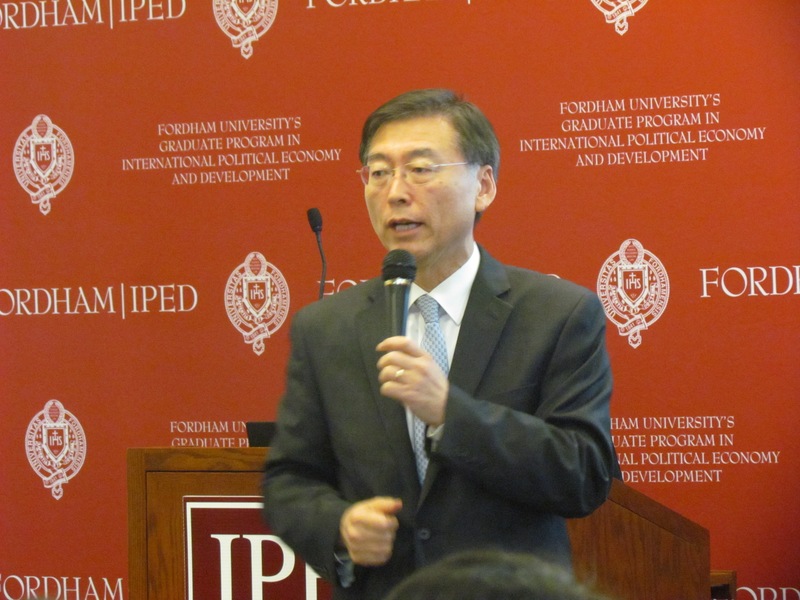 His presentation covered the “5 Ps: People, Prosperity, Planet, Peace, and Partnership.” He informed on the university partnership Action by Students to Promote Innovation and Reform through Education (ASPIRE) through the United Nations Academic Impact (UNAI) and the opportunity Fordham University has to become a partner.